NOM Cd based core/shell Quantum Dots provide narrow band fluorescent emission at wavelengths ranging from 400 nm to 880 nm. These core/shell complexes provide higher levels of photoluminescence and stability when compared to core only complexes. Our organic soluble quantum dots are surface coated with organic surfactants that make them lipophilic and soluble in organic solvents such as toluene, chloroform, and hexane. 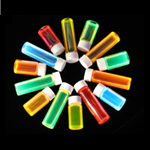 Our water soluble Cd based Quantum Dots are coated with hydrophilic ligands and are available with a choice of three different end functional groups: acid, amine or diol. Our improved PbS/CdS Near infrared (NIR) Quantum Dots extend fluorescent emission wavelengths available from quantum dots to the range of 900 nm to 1000 nm. These core/shell Quantum Dots have higher quantum yields (are brighter) and have greater wavelength stability relative to the core only PbS quantum dots that are commercially available. The organic soluble version of these core/shell quantum dots are surface coated with organic surfactants that make them lipophilic and soluble in organic solvents such as toluene, chloroform, and heptane. Water soluble versions of these QDs are coated with hydrophilic surfactants terminated with a choice of acid, amine or diol functional groups. All emission center wavelengths in the range of 900 nm to 1000 nm, ±10 nm are available from inventory. 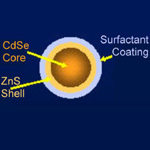 Cd Free Quantum Dots are composed of CuInZnS cores surrounded by a shell of ZnS. These CuInZnS/ZnS nanocrystals are offered as an alternative to Cd based quantum dots (QDs) where potential toxicity is a concern. 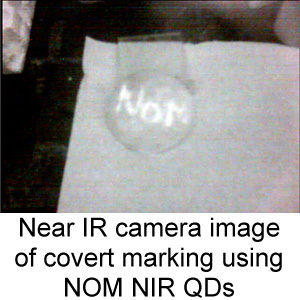 NOM Cd-free QDs provide the high brightness, strong optical absorbance over a wide excitation wavelength range, and photostability characteristic of all quantum dots. The emission bandwidth of the CuInZnS/Zns QDs is wider than Cd based QDs but is less than 100 nm for all wavelengths. These Quantum Dots are available in the range of 540 nm to 660 nm in both organic soluble and water soluble forms coated with a choice of three functional groups.